​Read how developing great coaching skills could set you on the path to PMO career success and deliver great results for your business. Traditionally, developing your career in the PMO was based on having great technical skills but increasingly this is no longer enough. Being a great PMO professional means becoming a trusted business partner who delivers services the business values and that requires supplementing your technical skills with coaching skills. The growing need for Coaching Skills for PMO Professionals can be seen in the increasing number of job adverts for PMO roles asking for coaching skills, and that trend is growing as Agile Project Methodologies become more prevalent. As I have worked with PMOs I have noticed how adding coaching skills has benefited team members at all levels, from the most junior to the PMO Leaders, and how actively developing them has boosted the team’s effectiveness and individuals’ careers. So what do we mean by Coaching Skills for PMO Professionals? For me, the best definition of coaching comes from Sir John Whitmore in his book Coaching for Performance, where he describes coaching as “unlocking a person’s potential to maximise their performance”. Coaching skills span a whole continuum of ways to work with someone, from telling them what to do, through teaching, consulting, mentoring and coaching. As you move along the continuum, the focus shifts from the coach’s knowledge and agenda to that of the person being coached. The coach uses their coaching skills and facilitates tools to improve the performance of others. The knack of finding a delicate balance of coaching which works for everyone is definitely more of an art than a science! When I shared the continuum of coaching at a PMO Flashmob session most people found that they spent time moving up and down the scale from telling and showing to mentoring and coaching on a daily basis – and sometimes even within one meeting! Why does having coaching skills matter in the PMO? Coaching skills are not just for training your staff; you can use them to build your relationship with your sponsors using coaching skills, which is critical to your success. With an improved understanding of their agenda, and an ability to help them articulate what needs to change and why, it is easier to explain your solutions and get their buy in. The skills developed in coaching will also help you align agendas within the business. The skilful use of coaching tools will provide objective, rational and constructive challenges as you help your stakeholders explore situations and understand the options they have. In doing so, they will also allow you to create and develop trusted partnerships. In the course of using your coaching skills, you lead by example. A consultative coaching-based approach has consistently been shown to be the most effective at leading change. And, at the end of the day, your role is to effect change. The very definition of coaching is to facilitate improvement, which is why this is the last – but most definitely not the least important – of the principles for PMO practitioners. As I have already mentioned, coaching skills are not just for those in PMO leadership roles; they are useful for all those working in the PMO. They can make a huge difference even at the most junior level. Imagine you have been asked to compile the minutes for a meeting. This requires listening skills, the ability to summarise and report accurately what has been said, and the ability to ask questions which clarify thinking. Holding these skills can make a huge difference to the quality of minutes being taken and their usefulness. As your career progresses, you may find yourself training others, or switching between consulting and coaching roles. For example, one of the project leaders you are working with may hit a problem and require your help to work out how to get through it – and your coaching skills will be invaluable. Coaching skills for PMO are beneficial to everyone working within a team, not just for those in management roles but for many different work situations and at different stages of your career. They help a project run smoothly, with better communication and greater clarity all round. 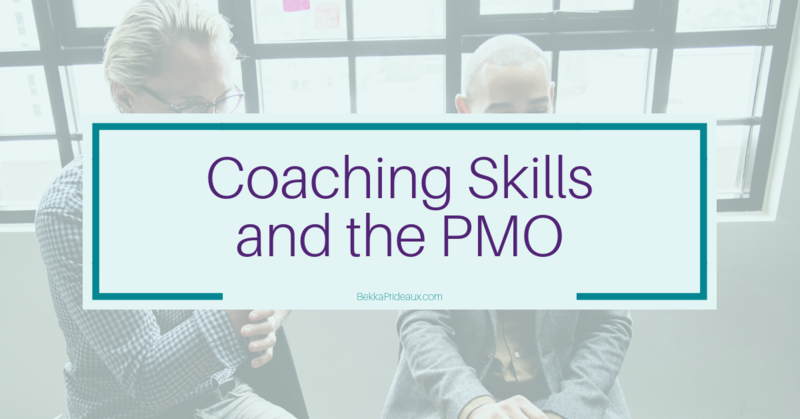 To be the best PMO professional you can be, you need to work on developing these coaching skills and keep building upon them throughout your career. Develop coaching skills you can start using immediately, and to learn about the one-day course I am running in association with PMO Learning. Jump Into Action & Get Results Before Summer! 20% Discount April Only!